Andrew spent a chunk of his childhood in the West Country - his experience of Cider as a, youth, is cycling down a country lane to the farm and filling up a bucket with Cider for a handful of pocket money. While in Somerset with my beautiful family, the proposition of cider in a plastic jug was put on the table. "You go in, try a few half pint sample glasses, then fill a plastic bottle with farm cider" explained my cousin. I grabbed my jacket with enthusiasm and off we went. We arrived at Burrow Hill Cider Farm, it was wonderfully rustic - as I bounded out the car this guy caught my attention. We wound our way through the farmyard, instagramming pictures of the building to our mums. I was won over by the leftovers of this ram - I have a fantasy about painting a skull (even if it's resin) in shiny metallic gold over the horns. Getting out of the car, a bearded terrier popped over to greet us - he had the most beautiful face! Apollo, just under 6months old now, still has a tendancy to greet other dogs with elevated enthusiasm "play with me! play with me!" he begs. But the terrier was so over puppies, he wanted to kick back in the sunshine instead of enduring a puppy all up in his face. You enter the cider shop via the back door... no exception! You walk into a barn where barrels upon barrels are stacked up. After a few oh this is the dry - can I try the medium - um, I think I liked the dry more - or was it the medium you commit to a few bottles! 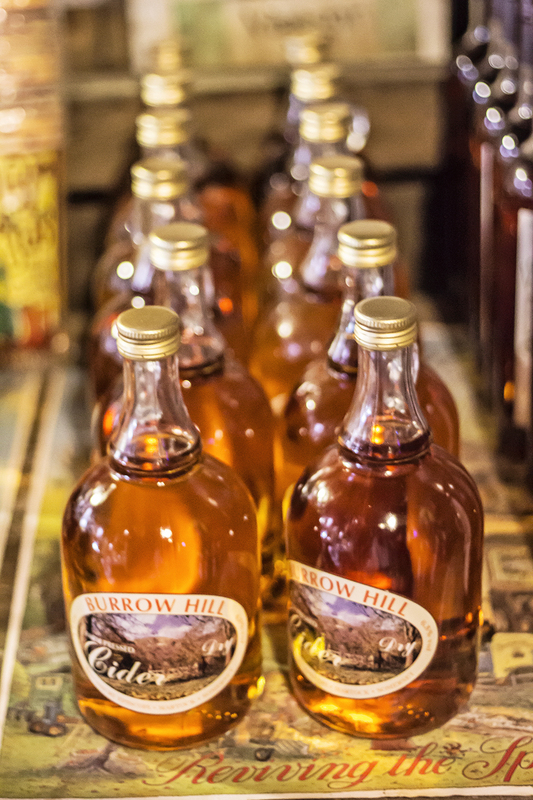 They don't just make cider, they also have cider brandy and all sorts of apple based drinks. After a round of tasters - theres an Orchard walk to help you get back on your feet. Apollo wasn't quite sure how to handle the sheep, he kept close between Hobbs and AJ. Every now and then we would loose the path, too distracted by endless conversations catching up. The trees are identified, with descriptions and information about them. After a few missed turns we found our way ou. Excited and ready to head back to the village to sip cider in the sun.